The 15 Best Historical Sites in Kansas! Kansas is rich with sites of great historical significance. From Art Deco theaters, to war sites, to sites belonging to some of the most momentous baseball games in history, Kansas has a lot of gems to be explored. Take in all the history, the mystery, and curiosities that celebrate the past. Here are the 15 best historical sites in Kansas. No other place in North America has the title of being—smack dab in the middle of North America, except in the countryside of Osborne. Surveyors and map makers used this original point, Marker #38, to plot the continental United States. The actual marker is located on privately-owned land, 18 miles southeast of Osborne. An identical bronze monument located near the Osborne Post Office celebrates the marker site. It was set by the Kansas Historical Society, the State Highway Commission and the Osborne Area Chamber of Commerce. Known as an architectural landmark, the clock tower was built in 1891, as an addition to the First National Bank Building. It came to be known as the historic Clock Tower Building and has been home to many businesses. It set empty for almost 20 years then after a $1 million renovation, the building officially reopened and named the Frances Sewell Plamann History Center, and is home to the Hiawatha city offices, the Chamber of Commerce and is listed as a state historical site by the Kansas State Historical Society. A 1.7-mile historic sidewalk, built in August of 1936 between the towns of Franklin and Alma, Kansas. The community sidewalk provided school students a way to-and-from school, after the town’s schools were consolidated. Over the years, the progression of paved roads, school busing and personal vehicles have lessened the foot traffic. Parts of the sidewalk has grown over with dirt and time. Listed on both the Kansas State and National Registers of Historic Places, many stories are told about this most unusual sidewalk. The Augusta Historic Theater opened in 1935, and is one of the last American movie theaters built in the 1930s. Today the theater is still in operation in downtown Augusta. A place to enjoy the beautifully restored Egyptian themed, Art Deco interior, while you watch a modern-day movie or a live theater performance. The theater also has musical concerts and various events. It’s always show-time in Augusta! The Santa Fe Trail connected America’s eastern states, beginning at Independence, Missouri and trailing through Kansas, before crossing the southeast corner of Colorado and ending in Santa Fe, New Mexico. Near Dodge City, some of the original trail ruts are preserved and have become a Kansas Historical Site. The historic ruts are located nine miles west of Dodge City on U.S. Highway 50 and are easily accessible for visitors. In the early 1800s explorers, Meriwether Lewis and William Clark, traveled up the Missouri River through the very northeast corner of Kansas stopping on July 4 near Atchison. Their expedition celebrated Independence Day with live gunshots. The city of Aitchison has constructed several tributes to these pioneers, one of which includes a covered pedestrian bridge connecting visitors to the Independence Creek Historic Site. Made of two-foot-wide limestone walls, the two-story jail in Iola began housing prisoners in 1869. Almost 100 years later the Allen County Commissioners deeded the abandoned jail structure to the Allen County Historical Society. The Historical Society restored the jail and opened the Old Jail Museum in the 1960s before it was added to the National Register of Historic Places in 1977 by the U.S. Department of the Interior. In 1913, the Chicago White Sox and the New York Giants baseball teams played a number of games across the United States, and one of those momentous games was played at a small-town ballfield in Blue Rapids, Kansas. A commemorative historical marker lets today’s visitors know where the baseball game was played before a significant crowd for Blue Rapids. The only game the touring baseball teams played that year in Kansas was in Blue Rapids. In June of 1867 Lieutenant Lyman Kidder and a company of 10 or more men, along with an Indian scout, were massacred during a war campaign known as the Hancock Wars. In the late 1960s, The Friends of the Library of Goodland Kansas created a historic marker in honor of the soldiers and scout who died. The monument marker is on privately owned land near Goodland where the event was thought to have occurred. The historic Mill’s Home located in Osawatomie was built by William M. Mills in 1902 with profits he accumulated from his lucrative oil business. The Queen Anne style home was built by noted architect George Barber. At the time this extravagant 7,000-square-foot home was built with ostentations woodwork and nine fire places. Today the home is listed on the National Register of Historic Places. Said to be one of the best landmarks located on the historic Santa Fe Trail and the halfway point for settlers to the area. Situated north of the town of Pawnee Rocks on U.S. Highway 56, this prominent sandstone pergola rises almost 60 feet high overlooking the surrounding Arkansas River valley. Known to be the place Indians could watch for approaching travelers to the area. A historic pillar shaped, granite monument complements this historical site. This historic chapel is part of the Western Branch of the National Home for Disabled Volunteer Soldiers in Leavenworth, Kansas. The ornate, late Gothic Revival chapel, was designed by Kansas City architects, Louis Singleton Curtis and Frederick C. Gunn. The two-story brick and sandstone chapel is home to two-story stained glass windows and gargoyles figures keep watch on the bell tower. The church was built with two separate chapel sanctuaries accommodating both Protestant and Catholic congregations. The Chisolm Trail Historical Marker is located near Abilene’s original town-site marker and symbolizes the first post of an estimated 400 trail posts, that stretch north to the near San Antonio, Texas. Cattlemen all along the Chisholm Trail drove cattle from ranches in south Texas to the northern Kansas railroads. Named after Jesse Chisholm, a multicultural Cherokee Indian fur trader, who explored and established this historical trace. Originally a Works Progress Administration (WPA) project, Coronado Heights Park was constructed in 1932. Soon after the WPA work was completed, the park was transferred to the Saline County Commissioners for management in 1936. Fifty years later the Smoky Valley Historical Association (SVHA) took over the care of the park and, that same year the special monument was built by Lindsborg artist, John Whitfield and SVHA volunteers. A stone shelter building and an observation deck were built along with stone picnic sites, restrooms, and a stone front gate to the park. 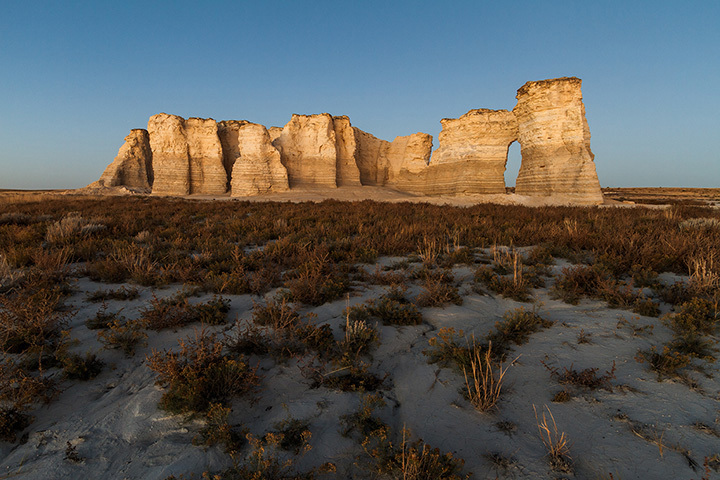 Monument Rocks, located south, south east of Oakley, is the first landmark chosen by the U.S. Department of the Interior as a National Natural Landmark. Reports state these famous rock formations were created out of the Cretaceous Period. A period when the Western Interior Seaway divided North America in half, about 80 million years ago. View more Kansas Historical Sites.